My little family has owned six pairs of these toasty toe keepers. From toddler size five to our current big foot at kids size three, I have never heard a word of cold footed complaint from my three kids. Snow Flurry Boots are perfect for everyday winter situations, backyard play, sledding and tromping to and from school. Someone with kids must have designed the opening, because it’s huge, making it easy for little feet to be maneuvered into them without too much strife. 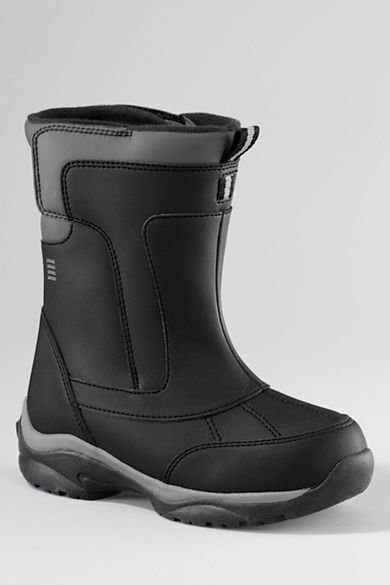 The Velcro side fasteners stay put and the boots never become soggy or slumpy. Price wise, they run above average, about $50. I have never paid that much for them, because Lands End puts them on sale frequently, especially at the end of the season. Purchase the boots in gender neutral colors. It’s easier to pass them down that way, and trust me, they’ll be around that long. To see this boot check out Land’s Ends website.